New York City Mayor Michael Bloomberg speaks at the opening of the New York Genome Center on Sept. 19 in New York City. Bloomberg talks with his daughter Emma (left) and sister Marjorie Tiven as they watch televised election reports on Sept. 25, 2001, in New York City. Bloomberg easily won the Republican primary over Herman Badillo. Bloomberg shakes hands with Gov. 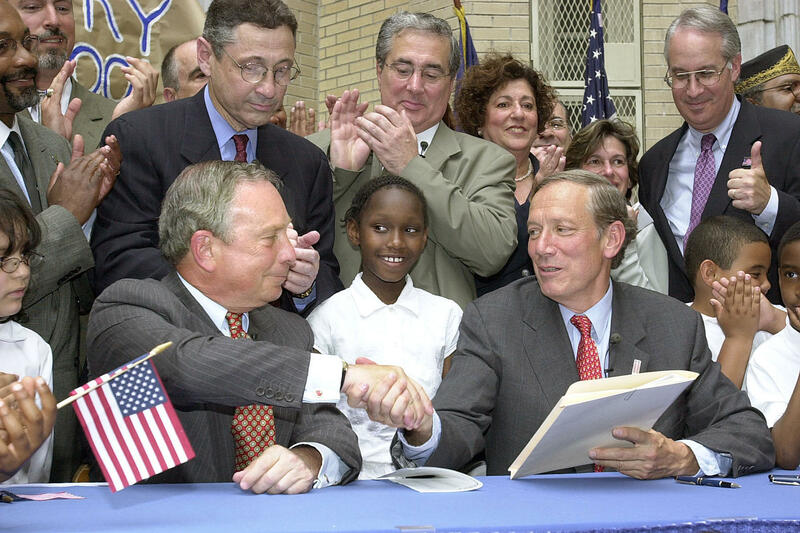 George Pataki after Pataki signed city school governance legislation June 12, 2002. The legislation gave Bloomberg control of the city's school system. 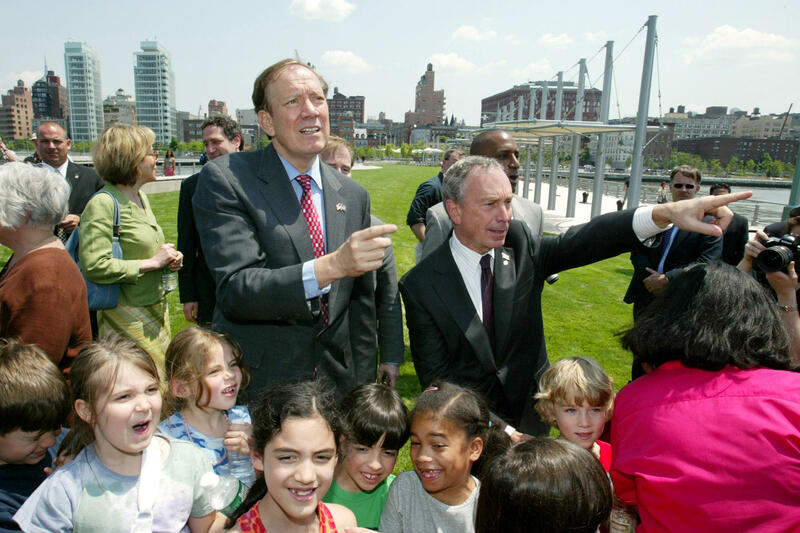 Bloomberg and Pataki (left) tour the first completed section of Hudson River Park after opening ceremonies May 30, 2003, with children from nearby Public School 3. The 10-acre stretch of Manhattan parkland along the Hudson River is billed as "the Central Park of the 21st century." 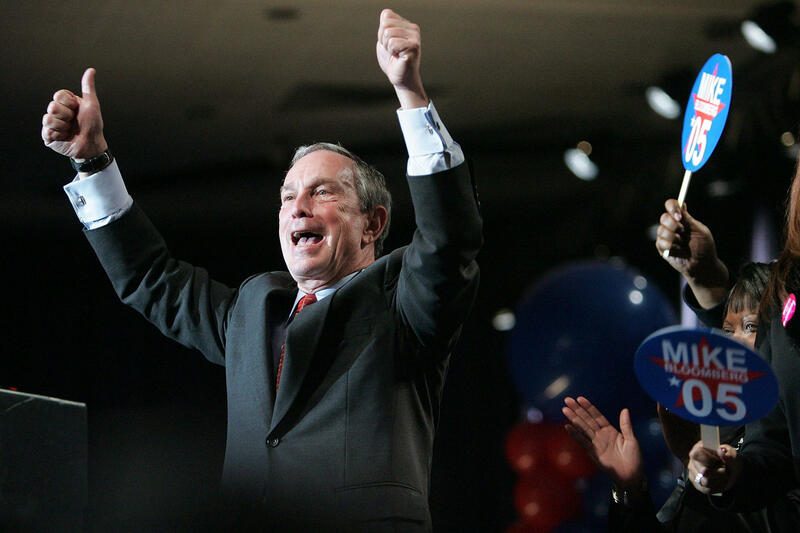 Bloomberg waves to the crowd at his election night party Nov. 8, 2005, in New York City. Bloomberg defeated Democratic challenger Fernando Ferrer. 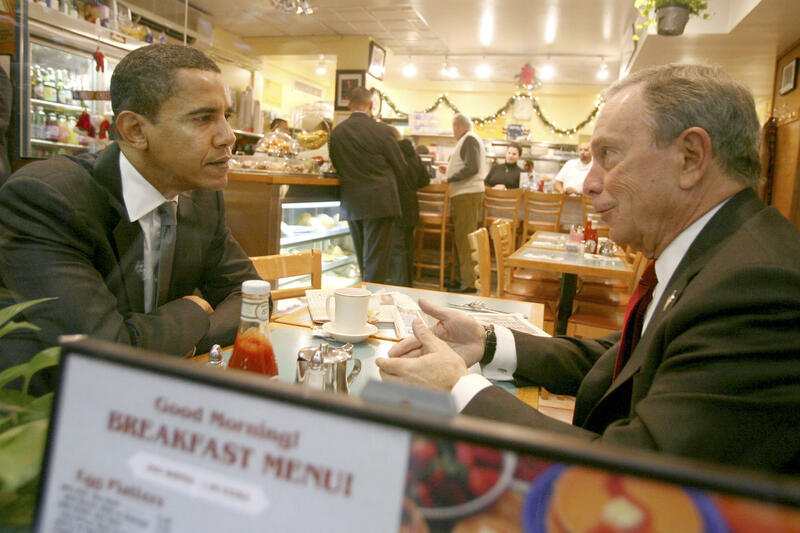 Bloomberg has breakfast with Barack Obama at a diner in New York City on Nov. 30, 2007, before Obama was elected president. Bloomberg and girlfriend Diana Taylor attend the CFDA Fashion Awards at the New York Public Library on June 2, 2008. 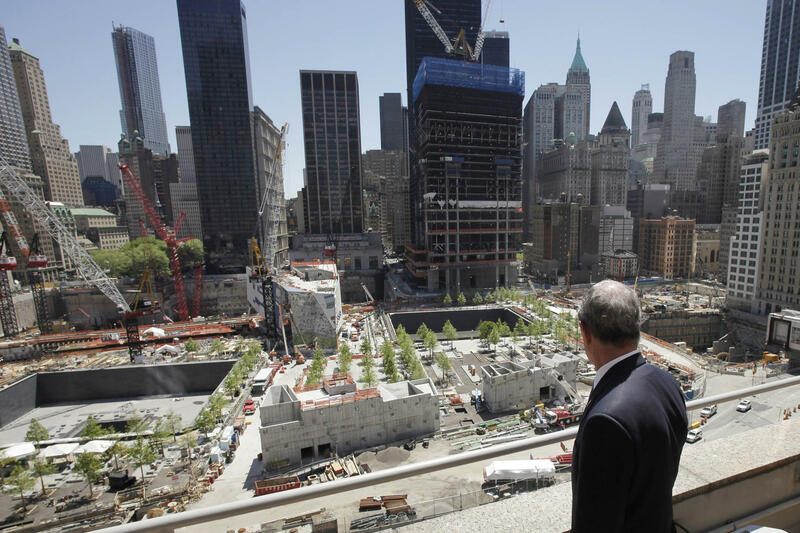 Bloomberg pauses to look at the World Trade Center site following a news conference on May 10, 2011. The Rev. 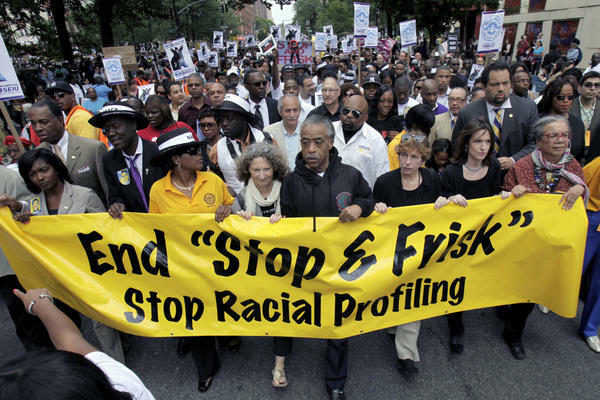 Al Sharpton (center) walks with demonstrators during a silent march to end the "stop and frisk" program in New York on June 17, 2012. Thousands of protesters from civil rights groups marched in defiance of the tactics employed by city police. 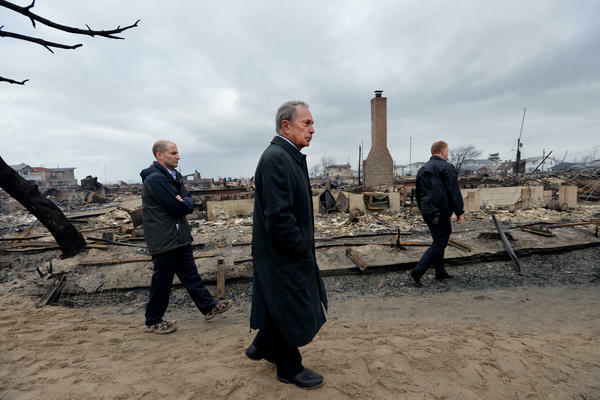 Bloomberg (center) views the Breezy Point area of Queens on Oct. 30, 2012, after fire destroyed about 80 homes as a result of Hurricane Sandy, which hit the area a day earlier. Bloomberg holds a large cup as he speaks to the media about the effects of sugar on health at Lucky's restaurant, which voluntarily adopted a ban on large sugary drinks, March 12 in New York City. A state judge blocked Bloomberg's ban. Bloomberg speaks during a news conference to announce an operation that seized the largest number of illegal guns in the city's history on Aug. 19 in New York City. The operation, which involved an undercover agent buying guns that were smuggled from North Carolina and South Carolina, yielded more than 250 guns. Nineteen people were charged in the operation. 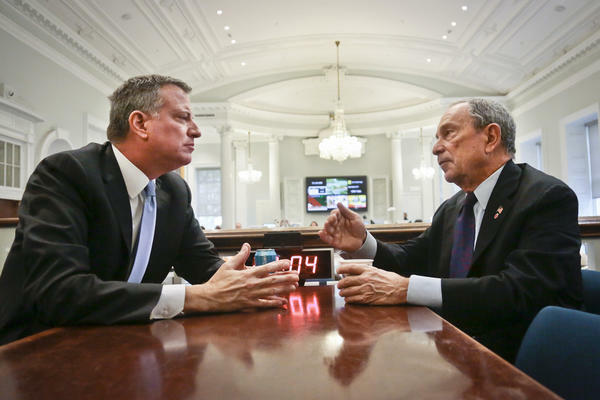 New York City Mayor-elect Bill de Blasio (left) joins Bloomberg for a meeting in the "Bull Pen," the mayor's main City Hall office, on Nov. 6. Bloomberg stands near a display of cigarettes during a news conference at City Hall, where he announced that New York City had filed a lawsuit against eight smoke shops on an Indian reservation on Long Island, on Sept. 29, 2008. At the end of this month, Michael Bloomberg ends his three terms as mayor of New York City. Assessing Bloomberg's legacy, a man who went from Republican to Independent, is not a simple thing to do. His 12 years in office were groundbreaking, locally and even globally. But at the same time, many New Yorkers found him arrogant and insensitive to the poor. It's a vein that was tapped successfully by Democratic Mayor-elect Bill de Blasio, who described New York as a city of haves and have nots. But the changes implemented by Bloomberg will impact generations of New Yorkers to come. "Mike Bloomberg has done things that no other mayor has ever been able to achieve, and his record over 12 years is going to turn out to be unmatchable," says Mitchell Moss, a professor of urban planning who advised the mayor in the early days of his administration. Moss says Bloomberg changed the face of the city through rezoning. "He took the waterfront, which had been in decay since the 1950s, and connected people with the waterfront with new parks and new housing. This city is now stronger than it's ever been. There are people who are living in places where no one went before. We have people who are traveling on the subway at all hours. It's busy 24 hours a day." Bloomberg revamped the board of health to deal with modern illnesses like obesity and diabetes. He banned smoking in the workplace, required chain restaurants to post calorie counts, banned trans fats, posted letter grades in restaurants and prohibited smoking in parks and on beaches. The mayor often says, "Life expectancy in our city is now three years longer than it was in 2001 and more than two years longer than the national average." These successes were noted in other cities that copied them. 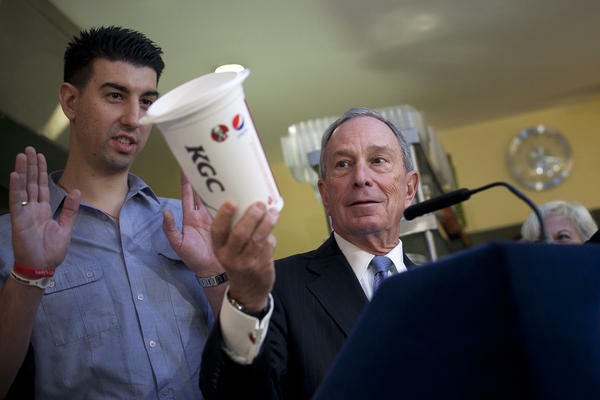 Bloomberg even tried to ban large sugary drinks from movie theaters and restaurants, but he failed. Professor Moss argues that Bloomberg made New York a laboratory with global impact. "Over 35 countries around the world have copied New York," he notes. "They have even banned smoking in the Irish bars. A Dublin pub was defined by smoke as well as by beer." 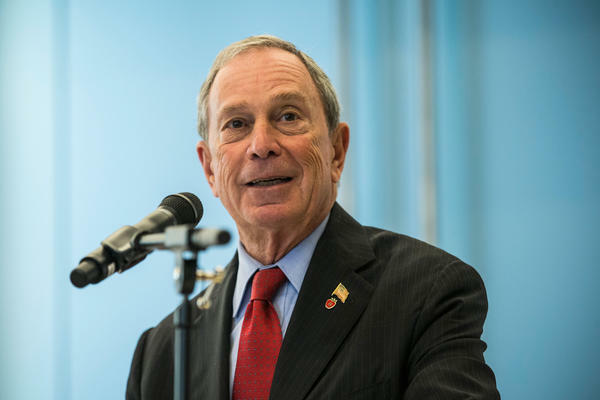 Bloomberg also inserted himself in national politics — for example, co-founding Mayors Against Illegal Guns. So, with all of this, where did the anger that propelled progressive de Blasio into office come from? Many New Yorkers thought Bloomberg was tone-deaf to people who were struggling. City Councilman Jumaane Williams says Bloomberg could have done so much more "had we had a mayor that wasn't as arrogant, and had we had a mayor who wouldn't mind listening to opposing points of views." At the same time that Bloomberg was celebrated for bike paths, smoking bans and glittering skyscrapers, hundreds of thousands of young minorities were experiencing a very different city at the hands of New York's police. Under the "stop and frisk" policy, they could be stopped and searched without a warrant. Although the numbers have since declined, in 2011, more than 600,000 mostly black and Latino men were stopped, questioned and searched. Almost 90 percent were not charged; they were innocent according to NYPD reports. The issue is still in the courts. Protests against the policy were held all over, including at City Hall. City Councilwoman Letitia James will soon have de Blasio's old job: public advocate. On the steps of City Hall, she called out to Bloomberg: "All that we are asking is that you come to the table and recognize that the rights of individuals have been violated. They did absolutely nothing wrong, and all that they wanted was to be treated as equals." 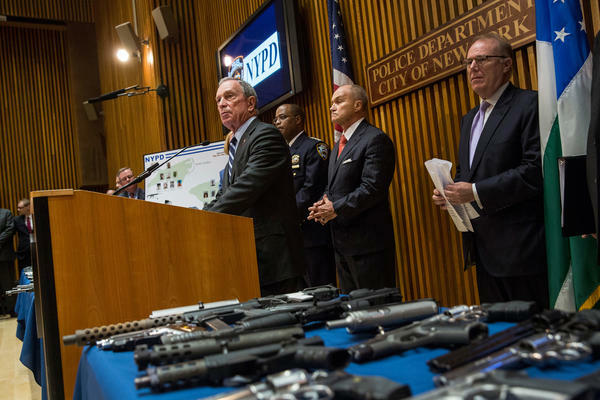 The Bloomberg administration has argued that "stop and frisk" made the city safer. The mayor went so far as to say the number of minorities stopped was not a disproportionate percentage of those committing or experiencing crime. "In that case I think we disproportionately stop whites too much and minorities too little," he said — a statement many viewed as insensitive. Councilwoman James ticks off the various constituencies left out of Bloomberg's New York success story: 1.7 million individuals living below the poverty level. "If you talk to individuals," she says, "particularly those in public housing, over 800,000 in public housing, they would give him a failing grade." Here's a stark fact: There are almost 52,000 people in the city's homeless shelters. That's more homeless people in New York City than at any time since the Great Depression. At one point, Bloomberg said the reason for that is that the shelters are now so pleasant. Patrick Markee, policy director for the Coalition for the Homeless, says the number of homeless people in New York City shelters has grown by 65 percent since Bloomberg took office. And one-third of those living in shelters are working, sometimes two or three jobs, Markee says. They just can't afford the rent. But Bloomberg supporters argue that the whole issue of inequality in the city has more to do with federal and state tax and spending policy, not the actions of the mayor. Sometimes the phrases Bloomberg uses are interpreted differently depending on one's class. Take this comment the mayor made on his weekly radio show: "We want the rich from around this country to move here. We love the rich people; they are the ones who buy in the stores so that people who work in the stores have jobs in the stores and generate sales tax. The rich are the ones that go to the expensive restaurants." If you are a struggling New Yorker, priced out of where you've lived, you might find those words insulting. Errol Lewis, the television host of Inside City Hall, told local NPR station WNYC, "Economically speaking, the elevator is broken. There are people who are stuck on the lower floors, they are trudging up the stairs, and they see a big party happening up in the penthouse. They're saying, 'Look, when are we going to get the elevator fixed? We want to get up there.' "
But many wealthy and upper-middle-class New Yorkers understand Bloomberg's statement differently. They see New York as a city competing with Paris, Berlin and London. Tourist dollars pour in; real estate prices continue to rise. Mitchell Moss points out that in 2003 Bloomberg raised property taxes on the rich by 18 percent, which helped cushion New York during the economic downturn. He says New York City has a social contract: "We tax the wealthy, which is then used to pay largely for schools and social services and safety. This is not an administration which says we want the wealthy just to have them here; we want them because they are helping to support the overall government." For some, Bloomberg's personal wealth has been proof that he couldn't be bought. He said what he wanted even when it wasn't politic. He said no when the Stock Exchange wanted a new building. He put out an ad for gay marriage, which he supported long before it was legal in New York. But for me, who has reported on this city all through the Bloomberg years, there is one moment that stands out. There was a huge debate over whether an Islamic cultural center and mosque should be built a couple of blocks from ground zero. People were passionate. This was close to where planes brought down the World Trade Center on Sept. 11. There were protests and marches and community meetings. But Bloomberg was defiant — willing to go against the mood and fears of a nation. "If we say no to the mosque," he said, "we would undercut the values and principle that so many heroes died protecting, and we would hand a valuable propaganda tool to terrorist recruiters, who spread the fallacy that America is at war with Islam. Today we are not at war with Islam — we are at war with al-Qaida and other extremists who hate freedom." Mayor-elect de Blasio talks of a tale of two cities, and there's truth in that. But as a reporter covering a man who spoke his mind no matter what, it was often a pleasure. The nation's largest city, New York, has gone through a lot of changes over the past decade or so, many of them tied to Mayor Michael Bloomberg. He's ending his 12 years as mayor at the end of this month. NPR's Margot Adler has reported on the city during all those years, and she brings us this look back. 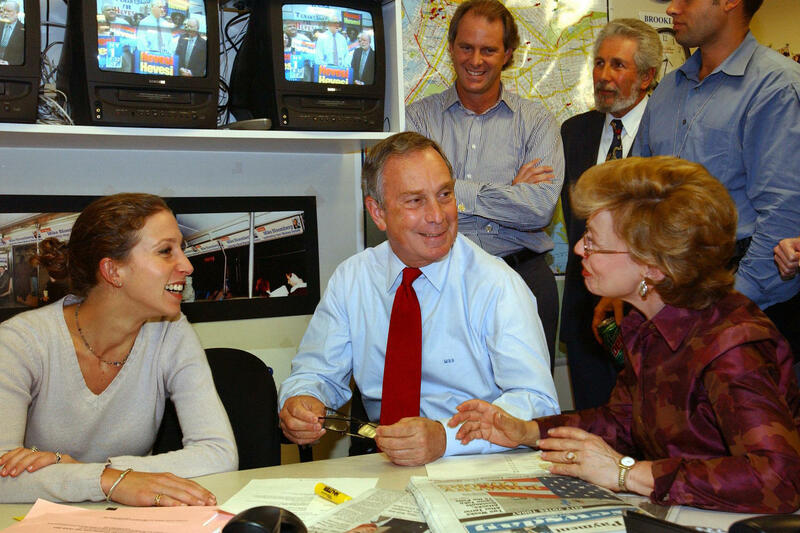 MARGOT ADLER, BYLINE: Assessing Bloomberg's legacy, a man who went from Republican to independent, is complex. It was groundbreaking, locally and even globally. But at the same time, many New Yorkers found him arrogant and insensitive to the poor, a vein that was tapped by Democratic Mayor-elect Bill de Blasio, who described New York as a city of haves and have-nots. But the changes implemented by Bloomberg will impact generations to come. MITCHELL MOSS: Mike Bloomberg has done things that no other mayor has ever been able to achieve, and his record over 12 years is going to turn out to be unmatchable. ADLER: Mitchell Moss is a professor of urban planning who advised the mayor in the early days of his administration. He says Bloomberg changed the face of the city through rezoning. MOSS: He took the waterfront, which had been in decay since the 1950s - when shipping moved to Jersey - and he connected people to the waterfront with new parks and new housing. This city is now stronger than it's ever been. There are people who are living in places where no one went before. We have people who are traveling on the subways at all hours. 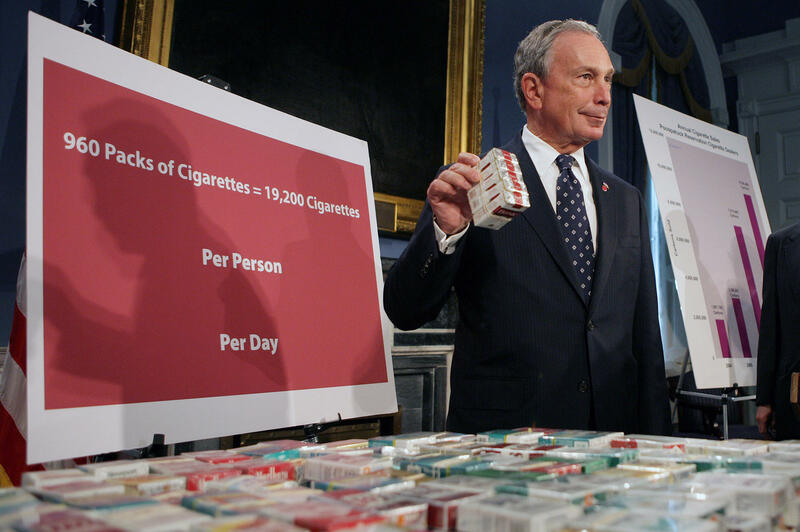 MAYOR MICHAEL BLOOMBERG: From banning smoking in the workplace to requiring chain restaurants to post calorie counts, to banning trans-fats, to prohibiting smoking in parks and on beaches. Life expectancy in our city is now three years longer than it was in 2001 and more than two years longer than the national average. ADLER: Professor Moss argues Bloomberg made New York a laboratory with global impact. He says more than 35 countries have copied New York, even Ireland. MOSS: A Dublin pub was defined by smoke as well as by beer. ADLER: Bloomberg also inserted himself in national politics; for example, co-founding Mayors Against Illegal Guns. So with all this, where did the anger come from that propelled progressive Bill de Blasio into office? Many New Yorkers thought the mayor was tone deaf to people who were struggling. Jumaane Williams is a member of the city council. He says the mayor could have done more. JUMAANE WILLIAMS: Had we had a mayor that wasn't as arrogant, and we had we had a mayor that actually wouldn't mind listening to opposing points of views. ADLER: At the same time that Bloomberg was celebrated for bike paths and smoking bans and glittering skyscrapers, hundreds of thousands of young minorities were experiencing a very different city at the hands of New York's police. Under stop and frisk, they could be stopped and searched without a warrant. UNIDENTIFIED PROTESTERS: (Chanting) Stop the stay! stop the stay! stop the stay! stop the stay! ADLER: Protests against the policy were held all over, including here at City Hall. Although the numbers have declined, in 2011 more than 600,000 mostly black and Latino men were stopped, questioned and searched. Almost 90 percent were not charged - they were innocent, according to NYPD reports. The issue is still in the courts. Letitia James spoke on the City Hall steps. She will soon have Mayor-elect de Blasio's old job: public advocate. LETITIA JAMES: All that we are asking is that you come to the table and recognize that the rights of individuals have been violated. They did absolutely nothing wrong. ADLER: The Bloomberg administration argued stop and frisk made the city safer. The mayor went so far as to say the minorities stopped were not a disproportionate percentage of those committing or experiencing crime. BLOOMBERG: In that case, incidentally, I think we disproportionately stop whites too much and minorities too little. ADLER: A statement many viewed as insensitive. Letitia James ticks off the constituencies left out of Bloomberg's New York success story. JAMES: One-point-seven million individuals living below the poverty level; it's been a mixed bag, but overall if you talk to just everyday individuals, particularly those in public housing, they would give him a failing grade. ADLER: Here's a fact: There are almost 52,000 people in city shelters. That's more homeless people in New York City than at any time since the Great Depression. At one point Bloomberg said the reason for that is that is that the shelters are now so pleasant. PATRICK MARKEE: The number of homeless people in New York City shelters has grown by 65 percent since Mayor Bloomberg took office. ADLER: Patrick Markee is the policy director for the Coalition for the Homeless. Markee says a third of those in shelters are working, sometimes at two or three jobs. They just can't afford the rent. But Bloomberg supporters argue that the whole issue of inequality in the city has more to do with federal and state tax and spending policy, not the actions of the mayor. Sometimes the phrases Mayor Bloomberg uses are interpreted differently, depending on one's class. Take this comment. BLOOMBERG: We want the rich from around this country to move here. We love the rich people, they are the ones who buy in the stores so that people who work in the stores have jobs in the stores and generate sales tax. The rich are the ones that go to the expensive restaurants. ERROL LOUIS: Economically speaking, the elevator is broken, there are people who are stuck on the lower floors, and they see a big party happening up in the penthouse. They're saying, look, we got to get up there. ADLER: But many wealthy and upper-middle-class New Yorkers understand Bloomberg's statement differently. They see New York as a city competing with Paris, Berlin, London. Tourist dollars pour in, real estate prices continue to rise. Professor Mitchell Moss points out in 2003, Bloomberg raised property taxes on the rich by 18 percent, which helped cushion New York during the economic downturn. MOSS: There is a social contract in New York City. We tax the wealthy, which is then used to pay largely for schools and social services and safety. This is not an administration which says we want the wealthy just to have them here. We want them because they are helping to support the overall government. 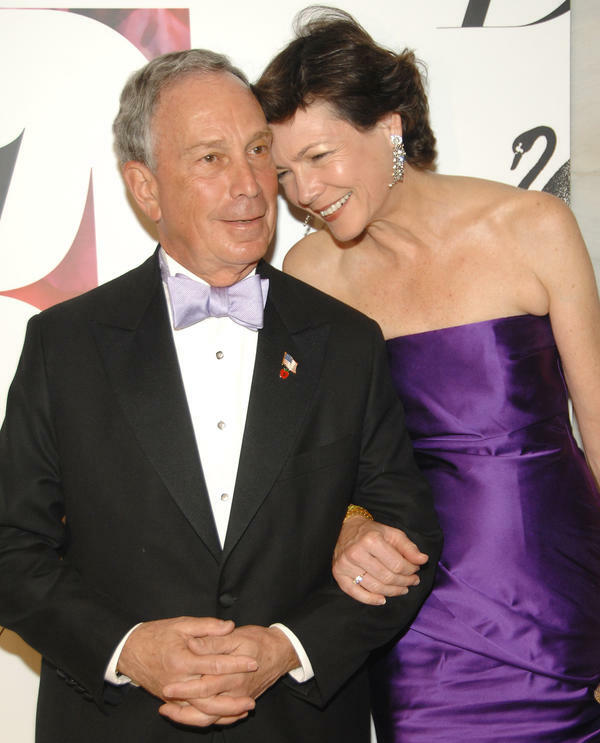 ADLER: For some, Bloomberg's personal wealth was proof he couldn't be bought. He refused to build a new stock exchange, saying it was obsolete; he supported gay marriage years before it was legal in New York. BLOOMBERG: Because government shouldn't tell you who to love or who to marry. ADLER: Mayor-elect Bill de Blasio talks of a tale of two cities, and there's truth in that. But many people will miss a mayor who transformed the city and spoke his mind even when it wasn't politic. GREENE: All right, that reporting from NPR's Margot Adler, who covered New York City through Bloomberg's 12 years in office. And Margot still on the line with us. And, Margot, I wonder, you've covered him for these years. Is there a moment that stood out for you? BLOOMBERG: We would undercut the values and principles that so many heroes died protecting and we would hand a valuable propaganda tool to terrorist recruiters, who spread the fallacy that America is at war with Islam. Today, we are not at war with Islam; we are at war with al-Qaida and other extremists who hate freedom. GREENE: That is quite a moment. Why did you find it so significant? ADLER: Well, you know, many civil liberties activists took the same position, but he was the mayor. And I found the fact that he had the confidence and sense of entitlement to simply throw off the residue of 911 very striking. GREENE: All right. NPR's Margot Adler joining us from New York. Margot, nice piece and thanks for talking to us. ADLER: It's been a pleasure. GREENE: This is NPR News. Transcript provided by NPR, Copyright NPR.